It is easy to get wrapped up in summertime activities all over the Barrie area. As soon as that last snowflake melts, residents go running full-on outside to enjoy the sunshine. This is great for a while but winter creeps up again before you know it – and it is better to be prepared. 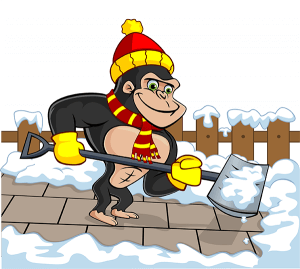 When you are ready for a winter wonderland but don’t want the hassle of cleaning up after one, our Gorillas are ready with our Barrie snow removal and salting. On paper, snow removal sounds pretty simple: Grab shovel, pick up snow, toss snow aside. Nothing could seem easier than moving snow from one area to another but clearing your property is much more difficult than just that. Every year, Canadians are forced to visit the emergency room following slips, trips and strains associated with shovelling. One oversized scoop can lead to pulled backs or shoulders while simple slips on patches of ice can lead to twisted ankles or broken bones. Who would have thought that an every day chore like shovelling could create such big problems? 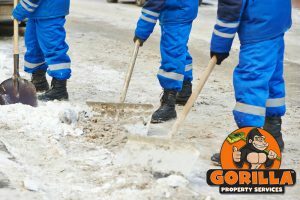 Instead of dealing with threats to your person or your property, call our Gorillas for your Barrie snow removal and salting. Our Gorillas operate safely and effectively to keep your property safe and passable for visitors or customers. As weather changes, the snow around your property will melt in the sunshine and refreeze overnight. You might enjoy the warmth of the sun during the day but dealing with ice in the evening can be dangerous. The most obvious solution to an icy sidewalk or walkway is put salt down but there is more to it than sprinkling salt over surfaces. Each and every property comes with its own problem areas. Finding these areas and taking the right steps to care for them is the only way to a proper Barrie snow removal and salting.